The first five volumes of Is It Wrong to Try to Pick Up Girls in A Dungeon? (or Japanese abbreviation DanMachi as I’ll be referring to it now) have proved to be a fascinating read full of wonderful adventures. That said, I’ve been eager for a brand new adventure; something uncharted and full of surprises – in other words, something the anime didn’t adapt. Thankfully that’s what Volume 6 of the light novel series is here to do and I couldn’t be happier with the result. This volume is set just a few days after the end of Volume 5, with Bell taking a few days off from exploring the dungeon to recover from the battle with the 18th floor boss. As tales of his adventure spread throughout Orario, it’s not long before our hero is the centre of attention, but not every adventurer is happy with the ‘Little Rookie’. As Bell, Lilly and Welf celebrate their safe return from the 18th floor battle, Bell has a run-in with members of Apollo Familia, which leads to all kinds of trouble! Conflicts between Familia are never a good thing but this time Bell’s rash judgement could cost him everything he holds dear. What started out as a simple bar-fight quickly escalates as god Apollo, who has taken an interest in Bell, declares that he won’t forgive Hestia Familia for the harm caused to one of his own. He informs Hestia that the only way to gain forgiveness is for Bell to join his Familia instead! After a swift refusal from Bell and Hestia, Apollo sets a plan into motion to force Bell to join him – including the kidnapping of Lilly and the destruction of Bell’s home! After Bell and Hestia are chased through the streets of Orario and reach the realisation that Apollo will stop at nothing to obtain Bell, Hestia agrees for the two Familia to face one another in a war game to settle things once and for all. Outnumbered and with their back to a wall, can Hestia Familia really make it through this crisis or will Bell soon be the newest recruit of Apollo Familia? For a volume that never once sees Bell set foot inside the dungeon, it’s certainly full of action and excitement. The first couple of chapters set up the overall arc while also tying up loose ends from the previous volume (including confirmation that Bell, thankfully, hasn’t levelled up again) but also offers the chance for some fine character development. Apollo decides to host a meeting of the gods but bends the rules so that every god can bring one member of their Familia to the party. It’s entertainment for the gods and an excuse for them to show off, but for mere humans like Bell it’s perhaps the most nervous he’s ever been! Fortunately he’s not alone in his awkwardness and it’s not long before he stumbles across Aiz, who is also feeling out of place. With some interference from Hermes, the two get the chance to dance together (as depicted on the front cover) and it is the most adorable scene I have had the chance to witness from this series. This is a volume that focuses on Bell and Lilly more than anyone else, so I’m glad that author Fujino Omori still found some time to fit in development between Bell and Aiz. Their relationship hasn’t really progressed since previous installments but I think it’s safe to call them friends now – and reading through their interactions is always satisfying. Bell is still terribly shy and awkward around her, while Aiz is as quiet and clueless as ever, but that actually works remarkably well for the two. If anything, I haven’t found myself wishing that they’d get over their shyness as I usually would be with other characters at this point. I won’t say too much concerning the war game as we’re fairly far through the book when it takes place but I do want to mention how well written all of the action scenes are. It’s not the first time Bell has fought against other adventurers – as there is always someone looking to pick on our hero – but it is the first time that the battle has been notably significant to the plot. I was surprised that the action held up as well as it did, given that there are no monsters to fight, but Omori has done wonders to capture the readers’ imaginations. It wouldn’t be wrong to say that Omori’s writing has improved a great deal from where he first started with Volume 1. I blasted through this volume in a couple of sittings, which is unusual for me with anything that isn’t a manga, and that’s purely because of how easy it was to become completely engrossed in the story. 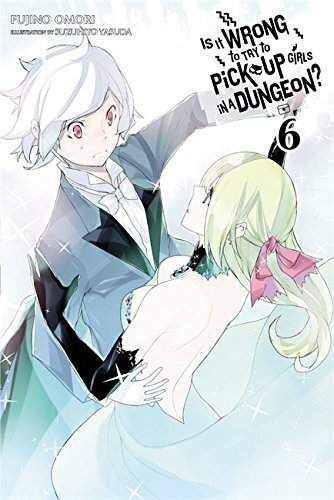 I’ve commented in the past that DanMachi is likely my favourite light novel series and I think I finally understand why it is. DanMachi always feels like I’m right in the middle of the action with Bell. Even while he was dancing with Aiz I could feel just how embarrassed the poor kid was! None of the other fantasy genre light novels I’ve read or am currently reading draw me in quite this much and the fact that DanMachi does is purely down to Omori’s abilities to create these scenes and characters. The illustrations for this volume were also handled very well by Suzuhito Yasuda, as they usually are, but were more interesting to look over than the previous volume. My favourite image on offer is definitely that of the front cover, but there were also some nicely drawn shots of Welf that I’m fond of. Overall it seems as though Yasuda’s art is improving volume by volume and he’s starting to have a good handle on the scenes that really deserve depicting. It’s amazing that, for a series set around exploring a dungeon, a volume in which we never once set foot in the dungeon could be so engrossing! It’s also refreshing to read a story that the anime didn’t cover (hopefully in a Season 2 though?). Considering that we were offered some solid character development for all of Hestia Familia I can definitely say that I’m satisfied with what I’ve read. My excitement for the next volume is already building and if you’re someone like me who has loved Bell’s adventure up until now, then Volume 6 is definitely both worth your time and a fine example of the series at its best. If you’ve enjoyed the anime of Is It Wrong to Try to Pick Up Girls In A Dungeon? then is it worth reading the original light novel series on which the popular TV series is based? Contains spoilers for previous volumes and the anime series. Is It Wrong to Try to Pick Up Girls in a Dungeon? continues to impress, and leaves the reader eager for a brand new adventure. Overall DanMachi is a fantastic fantasy adventure with a lot of heart… I highly recommend that everyone gives this show a shot.